1. Open a new file in PSP. Size 600 x 600 pixels, tick transparent box. Open clouds/sky from kit . Get pick tool and push inward 3 blocks on either side. Copy and paste clouds onto new file ( now known as tag from this point on) as new selection. Stay two blocks off top edge and left /right edges . 2. Open frame 2 and paper 7 from kit. Resize paper to 75%. Resize clipper ship to 90%. Copy and psate clipper ship onto paper " as new layer" > layers> merge visible. Get magic wand tool and holding down shift key, left click wand inside both open areas of frame 2 > marching ants. Left click on paper 7 > copy > paste into selection > select none. 3. Open sand from kit. Using pick tool, push inward from both side by 3 blocks. Copy and paste sand onto bottom of window frame " as new selection" and position as shown, sand should slightly cover base of clipper ship > selections> none. Repaste sand halfway down first sand to overlap. Selections> select none. 4. Open pier posts from kit. Image > resize to 55%. Adjust > sharpen. Copy and paste onto lower right side of tag " as new selection" and position as shown, keeping top of highest post on bottom edge of 9th slat on frame shutter. Effects>3D effects> drop shadow> selection> none. 5. Open wheat grass from kit. Image> resize to 65%. Adjust > sharpen. Copy and paste onto left side of window frame shutter " as new selection" , and position so that bottom of wheat is level with bottom of shutter as shown. Selections> none. Left click on wheat> image > mirror. Set this aside for a later step. 6. Open Ted Hammond Pirate. Image > resize to 90%. Adjust > sharpen. Copy and paste onto tag " as new selection" and position carefully as shown so that elbow is flush with left side of shutter, and bottom of pirates rock is level with bottom of pier post. Effects> 3D effects> drop shadow> selections> select none. 7. Get wheat set aside in step 5. Image > resize to 90%. Adjust > sharpen. Copy and paste onto left side of tag " as new selection" and position as shown , below the seagull and over pirates arm. Selections> select none. 8. Open rocks from kit. Image > resize to 60 % > adjust > sharpen. Copy and paste rocks " as new selection " and position as shown , staying off edge of tag , and stay off bottom of ropes on pier posts. 9. Open parrot from kit. Resize to 40%. Adjust > sharpen. Copy and paste parrot onto upper window frame " as new selection" and position as shown, with talons overlapping edge of frame. Selections> select none. 10. Image > resize tag to 90%. Adjust > sharpen. Add proper credits to tag . Save as PNG file. 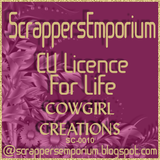 You may add Scrapkit by BarbieL/ACowgirlsCreatons but its not necessary unless you are a member of my creative team . 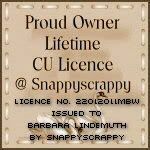 This tag and tutorial were created by BarbieL/ACowgirlsCreations on 4/23/11. Do not copy , reproduce or claim as your own. 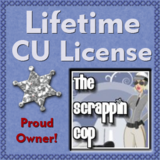 Do not post to any website forum or blog without my expressed permission. Do not translate.